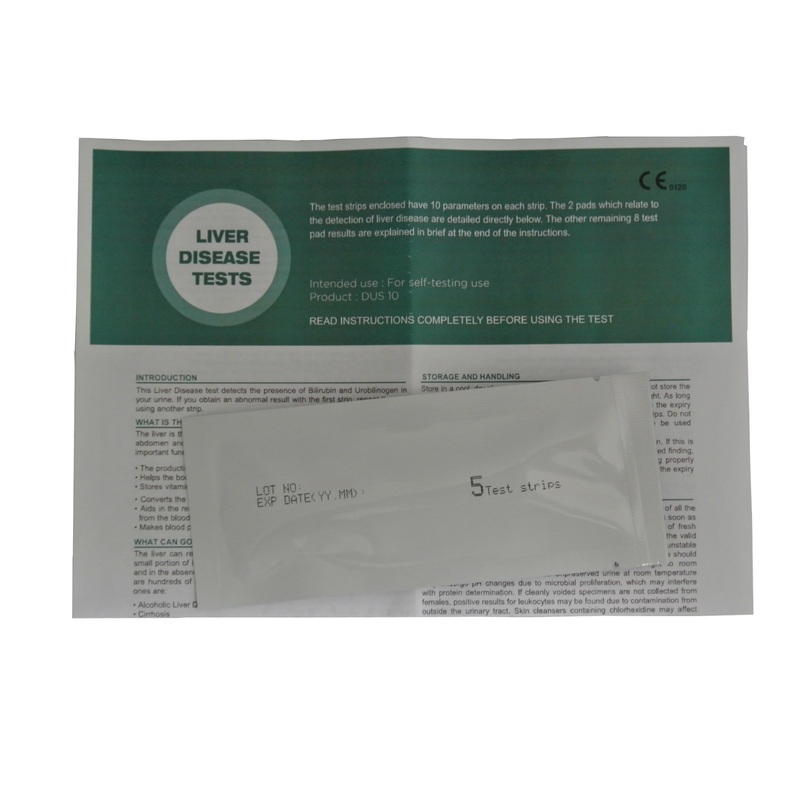 What does liver function test involve? Basically, you pee into a pot and dip the test strip into the urine and read the results after 30-60 seconds. Each test strip will test for Bilirubin and Urobilinogen. How do I read the test result? The test results are easily read by comparing the colour of the test result against the colours shown on the accompanying colour chart. The higher the level of Bilirubin and or Urobilinogen the darker the test result will become. 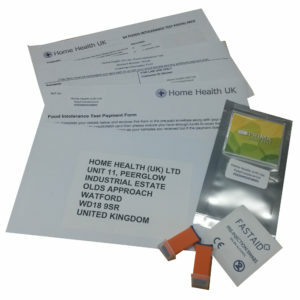 1 foil containing 5 test strips included in this pack – once the pouch has been opened, the remaining strip remains stable for up to 30 days as long as the pouch is immediately re-sealed. Liver disease refers to any disease or disorder that causes the liver to stop functioning as it should, examples of liver disease are cirrhosis . and hepatitis. For more information on the liver click here. Why do I need liver function test? Because of its location and many functions, the liver is prone to many diseases such as hepatitis A, B, C, E, alcohol damage, fatty liver and cirrhosis. There are over one hundred types of liver disease and they affect millions of people in the UK. This figure may only be the tip of an iceberg as many cases of liver disease remain undiagnosed. This is because your liver is very resourceful and able to work well enough even when it may be damaged. This means that you may often not ‘present’ with clear symptoms, or show obvious sign of liver disease or illness. This simple home liver function test can help to identify the health of your liver by checking for Bilirubin and Urobilinogen levels in your urine. Urobilinogen: is normally present in low concentrations in urine. High levels of Urobilinogen can indicate liver disease or conditions associated with increased breakdown of red blood cells. Bilirubin: is a brownish yellow protein usually excreted in bile. It is produced when the liver breaks down old red blood cells. Bilirubin is not usually found in normal urine. The presence of Bilirubin in urine is an early indicator of liver disease, obstruction of the bile duct or hepatitis. If urine contains Bilirubin it can make the colour of urine quite dark. 1 foil containing 5 test strips included in this pack. 1) Dip the strip into the urine up to the test area, ensuring all reagent pads are fully immersed. Dip for no more than two seconds. 2) Draw the edge of the strip along the brim of the vessel to remove excess urine; at this time, don’t make the test areas touched to the brim of the vessel. 3) Compare the colours of the reagent pads exactly after 60 seconds (Leukocytes after 90~120 seconds) with the colour chart on the vial label under good light. While comparing, keep the strip horizontally to prevent possible mixing of chemicals when excessive urine is present. The results comparison chart for urobilinogen shows a line of 5 colours starting with 2 normal results and then three positive ranges which get darker the higher the levels detected. The readings read from, 0.1 mg/dl or 16mmol/L, 2mg/dl or 33mmol/L, 4mg/dl or 66mmol/L, and lastly 8mg/dl or 131mmol/L these are indicated by a peach colour through to dark pink. The results comparison chart for bilirubin shows a line of 4 colours starting with a negative result and then three positive ranges which get darker the higher the levels detected. Compare the strip to the colour comparison chart. 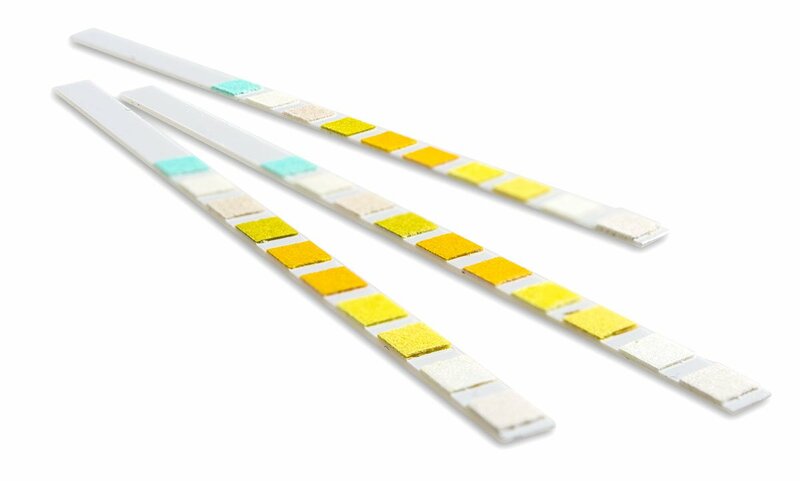 Compare each test individually, if the colour pad on the strip is the same colour as the negative reading on the comparison chart then no urobilinogen or bilirubin has been detected in your urine. If there is a small change of colour, repeat the test again the following day and if a similar result appears again then you should consult your doctor for advice. A high level means that the test has found excess urobilinogen or bilirubin in your urine. This does not always mean that you have a liver condition. However, it is very important that you visit your doctor to discuss your test result. NOTE: DO NOT TAKE ANY MEDICAL DECISION WITHOUT CONSULTING YOUR DOCTOR. Glucose: The results comparison chart for glucose shows a line of 6 colours starting with a negative result (pale blue) and then five positive ranges which get darker the higher the levels detected through to dark brown. If you get a positive result, consult your doctor. Ketones: The results comparison chart for ketones shows a line of 6 colours starting with a negative result (pale pink) and then five positive ranges which get darker the higher the levels detected through to deep burgundy. If you get a positive result, consult your doctor. 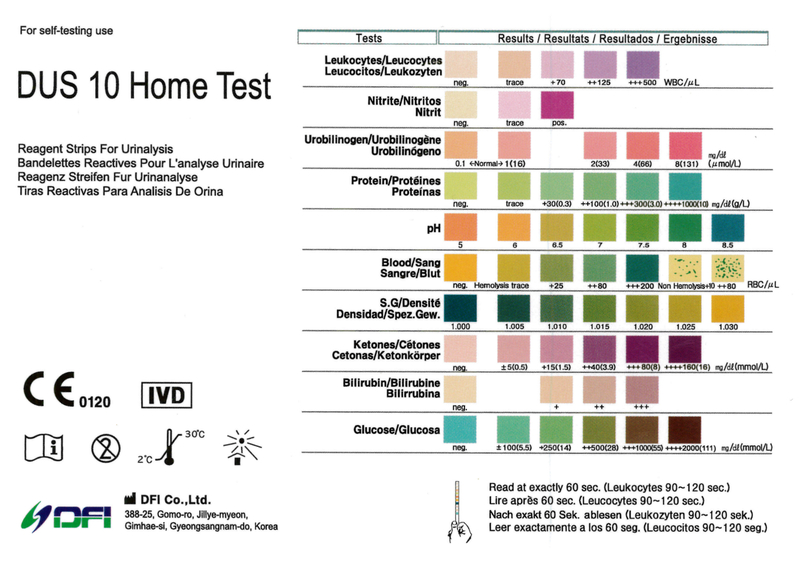 pH: Urine values generally range from pH 5 to 9. If you receive a highly acidic or highly alkaline result, consult your doctor. Leukocytes: If leukocytes are found in your urine sample the colour of the test strip will change colour and go dark pink or purple. If you get a positive result, consult your doctor. Is there a certain time of day when I should carry out the test? It is recommended that, you test first thing in the morning, since early-morning urine is the most concentrated. Women should not perform the test during or for three days after your menstrual period. The urine sample should not be contaminated with vaginal fluids since this may produce a misleading result. If I dipped the strip in urine for more than a second will this affect the result? If you left the strip in the urine for 2-3 seconds this will not affect the result but if left for more than 5 seconds the results could be inaccurate. Why should I use a fresh sample for this test? Bilirubin and Urobilinogen are sensitive to light and can decompose if left for a long time. Accordingly, the results may not reflect the actual concentration of these two compounds in the urine sample since they would be partly decomposed.